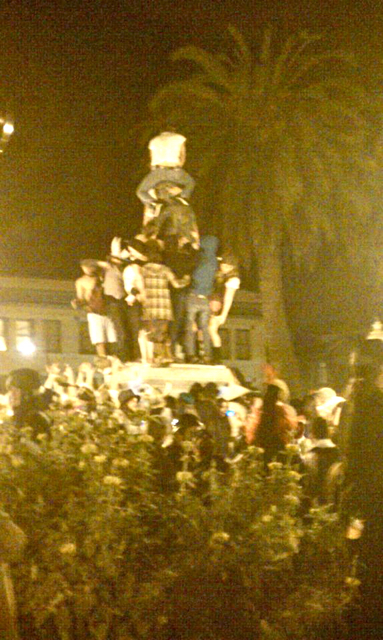 PLAZA – What began as a sweet, colorful celebration of H Street’s re-opening on Halloween ended with a near-riot, dozens of arrests and unprecedented destruction to the Arcata Plaza. As the last strains of the Marching Lumberjacks died down and the candy bags of trick-or-treating children swelled to maximum capacity, more than one kind of darkness fell on the Plaza. Halloween night celebrants roved the town square, many with bottles in hand and their numbers swelling as the night wore on. As the crowd grew denser, behavioral standards loosened until, as has become the standard for holiday Plaza celebrations such as New Year’s Eve, the more adventurous members of the crowd – mostly college-age youths – climbed up on the statue of President McKinley. Several of the McKinley-mounters pretended to engage in sexual activity with the stoic statue, while one man reportedly urinated onto spectators from it. Meanwhile, carefully cultivated planter boxes were thoroughly trampled by hordes of carousers. Numerous bottles were broken, the glass crunched into the Plaza grass. 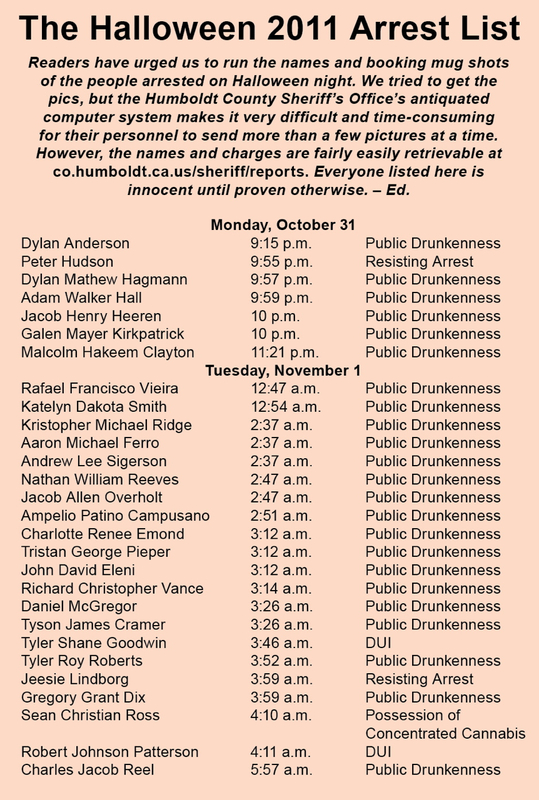 Arcata Police made more than two dozen arrests (see below), though nowhere near the number of actual violations. “There could have been hundreds of arrests,” said Lt. APD Ryan Peterson. He said that the 14 officers on duty arrested only those who were extremely intoxicated and a danger to themselves or others. 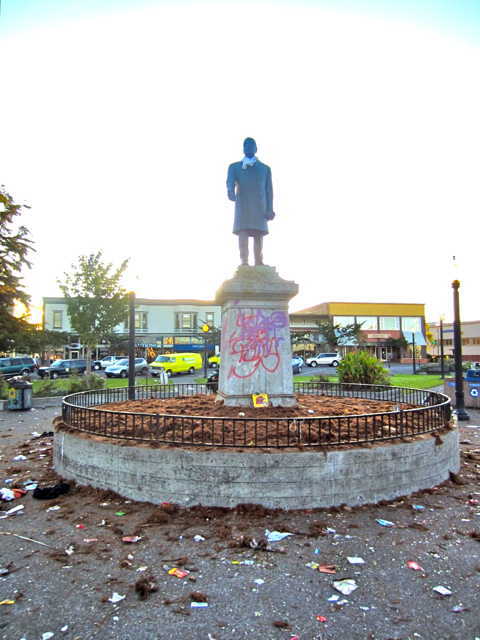 The next morning, the crowds had dissipated, but their residue remained in the form of destroyed foliage, broken glass, overflowing garbage cans and a McKinley statue whose base was coated with multiple spray-painted tags. He said that the City has to address the problem, because as bad as the destruction was, things could have taken an even uglier turn. 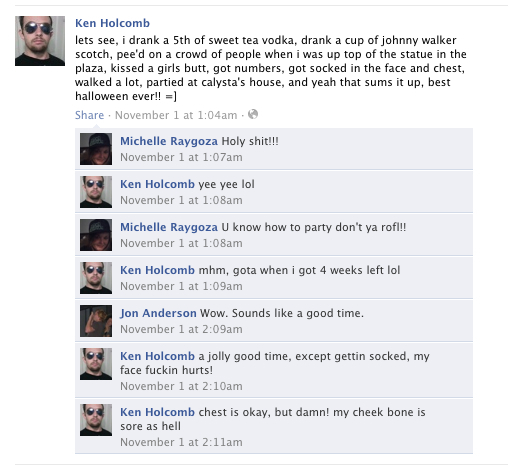 A Facebook user named Ken Holcomb identified himself on his page as the man who urinated on the Plaza crowd from the McKinley statue. Following an inquiry for confirmation, Holcomb didn't reply, but made his page private. According to Parks Supt. Dan Diemer, some 51 bags of trash and recyclables totaling 3,000 pounds were removed from the Plaza. McKinley’s base was pressure-washed to remove the graffiti. Public Works and Parks workers were diverted from other jobs to spend the day restoring the Plaza to safe use. This delayed or prevented other work from being done, including maintenance, construction, sports field preparation and other tasks. The total cost of the cleanup, not including the destroyed landscaping, was $3,600, Diemer said. 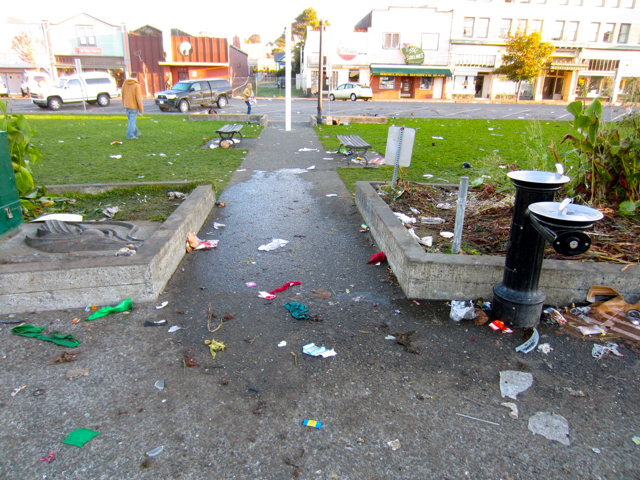 City officials will address some of the problems during the monthly liaison meeting with Humboldt State officials tomorrow, Nov. 10. A Community Meeting will be held Wednesday, Nov. 30 at 8 a.m. at City Hall to consider ideas for preventing a reoccurrence. Mayor Susan Ornelas said counterprogramming might be one approach to abating the problem. She said she also wanted to set up a citizen group to study whether the City could invigorate the nighttime entertainment scene with more wholesome late-night entertainment alternatives. This entry was posted on Tuesday, November 8th, 2011 at 9:27 am	and is filed under News. You can follow any responses to this entry through the RSS 2.0 feed.